"Mudder I'm Stuck with Cancer but Jumpin' Jesus We're gonna beat it!" 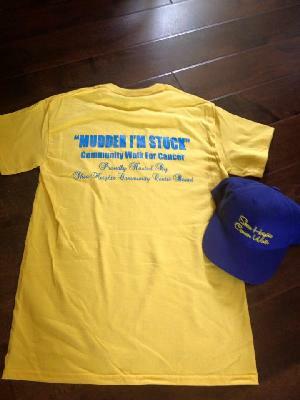 Donate to Mudder I'm Stuck Cancer Walk! Help us make an impact and improve cancer information for the future! We're hosting a community-based fundraiser to support the mission of Daffodil Place. The money raised helps cancer patients from outside the immediate St John's and surrounding areas, have a place to stay while in town receiving cancer treatments. Daffodil Place also incorporates a resource room that offers wigs, prostheses, turbans, ect to all cancer patients free of charge. They also offer a driving program for those unable to make appontments supported by a bank of volunteer drivers. Every donation takes us one step further in the fight for life. Online pledging is secure and saves the Canadian Cancer Society money by reducing administrative costs. Set up your own Pledge account today and walk with us while we help the fight against cancer! Curious about the viral video that inspired the "Mudder I'm Stuck" theme? copy and past the link below in your browser to watch the video! Please help us reach our goal this year of $3000! We can do it!